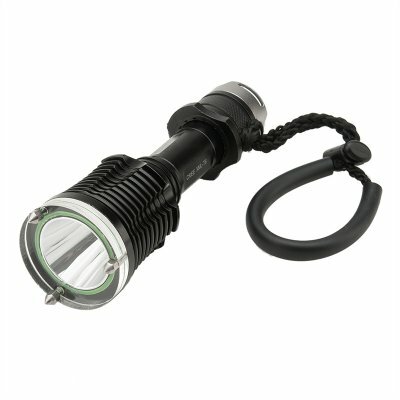 Successfully Added CREE XM-L T6 LED Diving Flashlight - IPX7, 1200 Lumens, 5 Light modes, Emergency Hammer + Cutter to your Shopping Cart. Designed for life beneath the waves this Diving Flashlight has a Cree XM-L T6 LED, and powerfull battery to produce 1200 Lumens of light wherever you may be. 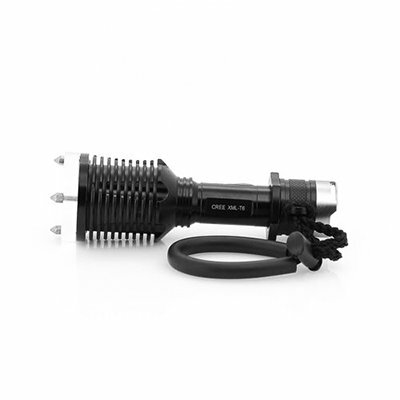 With Cree XM-L T6 LED technology this 1200 lumens torch is the perfect way to illuminate your world. It has 5 different lighting modes and three lighting intensities; high, medium and low as well as a strobe and SOS function so as you can draw attention in case of emergencies. All the modes can be easily selected using the rotary switch. The lens has a glass coated cover to protect it and also magnify the light output. This sturdy flashlight was designed for diving and is made from a strong aluminum alloy which helps protect it against the elements; it has an IPX7 waterproof rating to help against water ingress and ensure it can keep operating in harsh conditions. The powerfull battery will provide enough power for most uses and it’s easy to carry or keep with you thanks to the adjustable wrist strap. The case has a built in emergency cutter while the metal pins on the head of the torch can be used as a hammer making this versatile utility torch suitable for a host of activities such as hiking camping, search and rescue, diving, security and much more. This product is in stock now, we guarantee next working day shipping and offer a 12 months warranty on all our products. Brought to you by the leader in electronic devices and wholesale LED Flashlights, Chinavasion.